Proslat garage storage baskets (package of 3) are 15 in. wide x 11 in. deep x 8 in. high - ideal for garage storage & organization. These rugged baskets will hold balls, toys, sports gear, paint cans and just about anything else you want to throw at them. Made from high quality welded, powder coated steel in Proslat silver for years of durability. Ventilated wire so you can see what's inside even positioned overhead. Powder coated in Proslat Silver for rugged durability & attractive finish. Easy to use - simply hook into the channel and move as often as you like! Get your garage, garden shed or workshop neat and organized with the Gladiator GearTrack Channel Kit with 8-Hooks. Perfect for holding gardening tools, long-handled tools or shop tools, this kit's hooks are made of heavy-welded steel with a powder-coated hammered granite finish and have vinyl tips to hold your items securely in place. Simple to coordinate with other Gladiator products for added functionality and to create a uniform look, this set includes two 4 ft. pieces of GearTrack channel, mounting hardware and a wide variety of hooks. Banish clutter from your garage with the Husky Track Wall Storage System. Ideal for storing power tools, saws, multiple rakes & shovels, trimmers and other bulky items. Husky Track Wall Systems are the perfect solution for a messy garage - put your walls to work and get the clutter off the floor. To use: Simply clip the back plate into the track in desired location and gently press against track wall to engage the lock. To move the hook, disengage the lock and pull the hook upward and out of the hook channel. For more handy storage options, add other Husky Track Wall Storage & Accessories. Wall Storage Solutions - Baskets, 15 Inch x 11 Inch x 8 Inch, Steel, 3 Pack, Silver Proslat garage storage baskets (package of 3) are 15 in. wide x 11 in. deep x 8 in. high - ideal for garage storage & organization. These rugged baskets will hold balls, toys, sports gear, paint cans and just about anything else you want to throw at them. Made from high quality welded, powder coated steel in Proslat silver for years of durability. 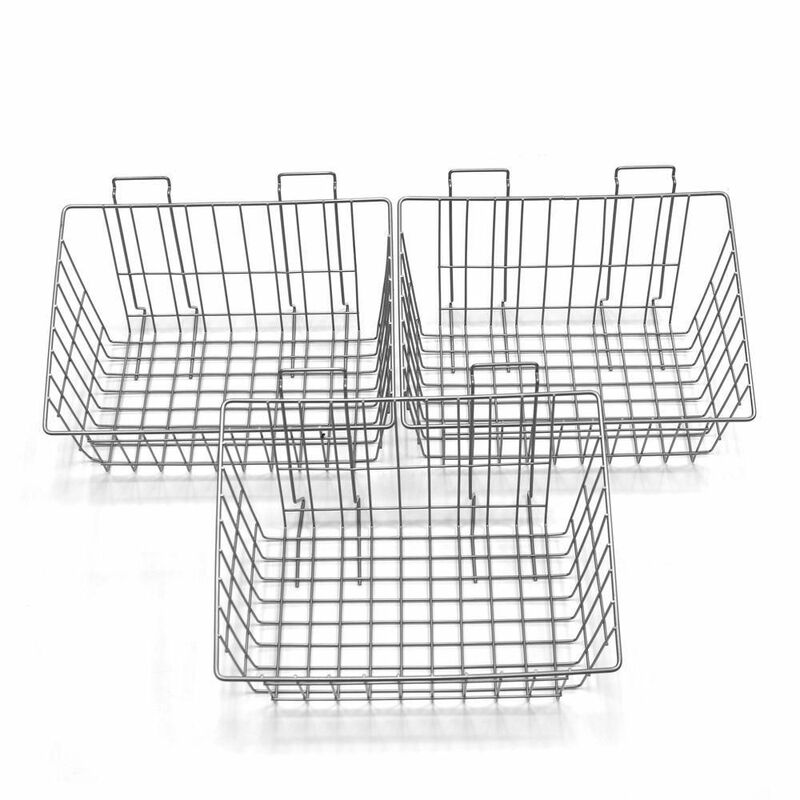 Wall Storage Solutions - Baskets, 15 Inch x 11 Inch x 8 Inch, Steel, 3 Pack, Silver is rated 4.8 out of 5 by 4. Rated 5 out of 5 by Arlene from ProSlat is an excellent product.... ProSlat is an excellent product. Rated 5 out of 5 by organizer from For Christmas I got my husband the Proslat 32 sq ft wall panels ; which he and a friend installed... For Christmas I got my husband the Proslat 32 sq ft wall panels ; which he and a friend installed easily. My husband loved the unit and I loved that the garage was finally taking on a cleaner look. I thought I was pushing my luck for even more organization when I got him the the baskets for his birthday, but I was surprised to come home to see small boxes of tools in one basket, odds and ends like measuring tape, duct tape, etc in another, and screw drivers and other hand tools poking through the third (as another reviewer recommended). They are sturdy and slip right in between the panels easily. In 22 yrs. my garage has never looked so organized, and have tools been so easily located. I may buy a second full unit for another wall! The entire wall looks so clean and organized! Not the most romantic gifts, but worth their weight in gold! Rated 5 out of 5 by Susan from Very Handy and Organized The baskets are very handy for holding the smaller items that get lost in the bottom of the tool box. I bought them especially to hang the screwdrivers. They fit perfectly between the wires. I can easily see all the sizes and types and then pull out the one I want to use. Rated 4 out of 5 by Diyselfer from Slatwall Purchase The product is very good, but the delivery was flawed.